Dart World's new Talon Dart places the accent on "Feel and Accuracy". 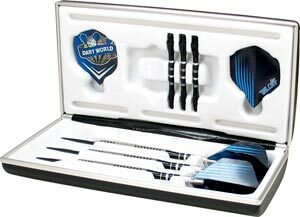 These 80% tungsten darts feature that "non-slip grip" that many players require to help their game. The rugged barrels feature high-rise knurling and/or grabbing grooves allowing the shooter more control and less slippage. The Talons come in Dart World's metal Ultra Case.